Great performers who have already offered their variations on the “Chair Test” routine to the market, I’d like to share with you my Chair Test Mentalism Mind Magic Routine without any Chairs being used that I have been performing on and off for a little over Six Months now with great reactions. I always where possible like to include music into my routines as much as possible and an element of situational comedy style humour whilst still retaining (or preferably amplifying) the reaction to the effect. For the record there is no thumb writing used in the clip you are about to see of my routine, a routine that will be explained in depth in my forthcoming “Mentalists Cook Book” DVD Package which is due for release in Mid August 2012. I hope you enjoy watching the routine and look forward to hearing your feedback. The Holy Grail Of Mentalism – The Berglas Effect ACAAN – LIVE..
And for that price your essentially going to have to start learning a completely new way to handle a deck of cards in order to learn literally only half a dozen effects all of which are very similar in nature and style, and all of which will take a lot and I mean an awful lot of dedicated practice before you ever have a chance of pulling them off in public. 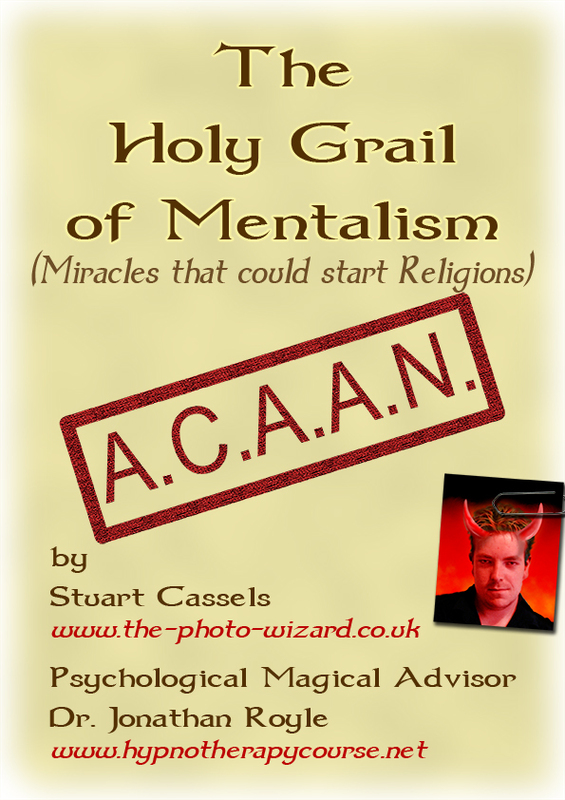 In this Admittedly slightly unclear video clip, that was filmed on an old mobile phone in a nightclub bar, Hypnotist Robert Temple Performs another version of ACAAN that is taught in “The Klear Thoughtz” Package..
And remember you can learn all of the above, along with Numerous other Magical and Mentalism Routines for just £60 (approx $94) and the methods used are far easier to learn and perform than anything you will find within the pages of The Berglas Effects book by Richard Kaufman and David Berglas of that I can assure you. But hey I know what your thinking, your thinking this sounds to good to be true, well consider that for just £60 (approx $94) at http://www.magicalguru.com/klearthoughtz/ you will not only get the “Klear Thoughts” Ebook, but also will be sent numerous Physical Training DVDs Post Free Anywhere in the world and you’ll start realise where your money would be best invested. I know I may seem a little biased, but I can assure you that not only would you be spending less money by ordering the “Klear Thoughtz” package, but also you’ll be getting access to far more easy to learn and easier to perform real world commercial material. Take a look at http://www.magicalguru.com/klearthoughtz/ and also take a look at the details at the links on that page which explain all of the material you’ll recieve and learn for your one time investment of just £60 (approx $94) and you’ll realise that this Limited Time Only bumper package offer represents the biggest bargain of your magical lifetime. There are so many routines to explore that while I have combed through this book cover to cover, I haven’t retained nearly as much as I like. I challenge you to read this section of the book and not feel energized by what appears to be a simple card routine. It is, for me, one of the most stunning routines I’ve ever read. I only wish I could have seen it performed and experienced the impossibility of it before reading about the work. While I don’t expect any Mentalist who hates using playing cards in his/her act to be totally converted after reading that section, I do believe that this routine has the BEST chance to cause some of these folks to re-consider some of their views.